Sammylou's Adventures In Craftland: Christmas Collections Blog Hop!!! Hello all and welcome to the Funky Hand Christmas Collections Blog Hop!! How exciting?! 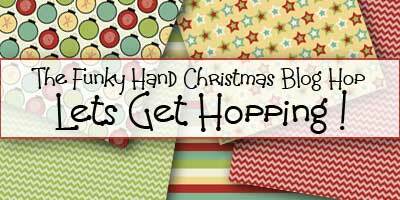 So, the Funkettes are having a blog hop to celebrate the release of the 2013 Christmas downloads from Funky Hand. These beauties aren't officially available until Sunday 8th September 2013 but we'd thought we'd show you all a sneak peek and give one lucky winner the chance to win a download collection of your choice. As you would expect, the collections have some absolutely fabulous papers, wordbooks and some seasonal digistamps too. In fact. everything you will need to make your Christmas cards truly stand out this year! The blog hop starts on Anice's Funky Hand blog and is open from 8.30am GMT Saturday 7 September to Midnight GMT Sunday 8 September. Each of us will have a letter and you will need to comment, retrieve the letter, solve the anagram and pop the answer (along with your favourite download) on the Get Funky and Craft blog to be in with a chance of winning. I love these doodle words. Great cards. I love how you have used the Doodleword digital stamps cut out on both of these cards Sammylou. You must have a very steady hand! They look amazing.